If you saw this post and then this post, you know I'm traveling this week! But fear not! My buddy Holly from Life in the Lofthouse has stepped in to share her Pumpkin Cookies with Caramel Frosting with us! The first thing I think I ever said to Holly was something along the lines of “Oh my God! Look at your hair! It’s so big and beautiful! Are you sure you’re not Southern? !” And then I stalked her facebook page and saw how gorgeous her husband and children were I decided the universe would never allow us to be friends because I’d probably get her dirty if I came within ten yards of her. And then… and then I got to know her and learned that she’s as wonky and edgy and crazy as I am fell instantly in love with her! I have made a lot of acquaintances over the years blogging. And I have also made some friends. People who help out like Holly (and Mary and Stacey and several others). We have to deal with all sorts of stuff as bloggers… techy stuff that makes my eyeballs hurt, rude people who think the anonymity the internet provides makes it OK to be mean, the ever-changing social media algorithms we’re always trying to stay in front of, etc. and it’s such a joy to have become friends with folks like these guys who encourage, teach, lead, share and sometimes just listen. And Ima let Holly take it from here! Hi, everyone! I'm Holly Lofthouse, the creator of Life In The Lofthouse.com and I'm super stoked to fill in for Miss Mandy, while she's away! I absolutely love her blog, and have been a huge stalker, I mean fan, for a while now. ;) Not only do I adore her recipes, I adore Mandy. I love her honesty and humor in her writing. She is a doll! My food blog is Life in the Lofthouse.com. It's full of easy, yet awesome recipes. I've been blogging for 4 years now, and I still love it (most days anyway! ha) I also work for Pillsbury as a recipe creator. It has been a blast working for them! I have 3 kiddos, and married to my hubby for 8 years now. Between school, gymnastics and homework we have a crazy busy life, so I'm all about simple recipes I can get on the table fast! 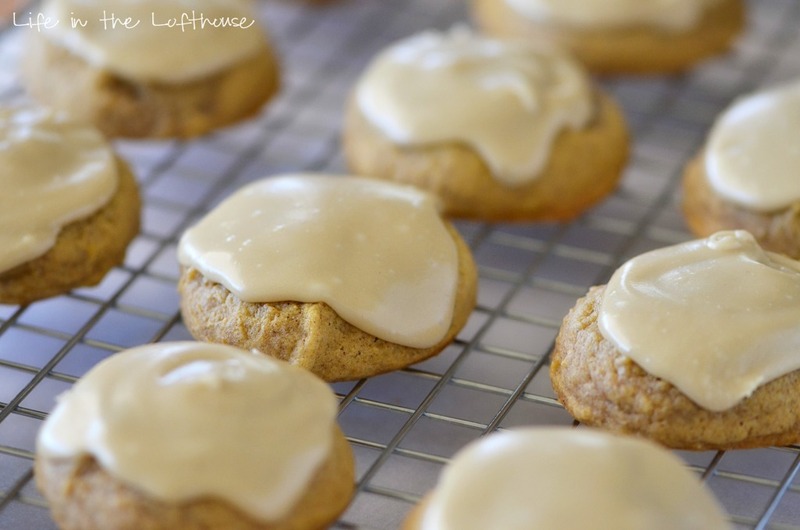 Today I thought I'd share these AMAZING Pumpkin Cookies with Caramel Frosting. They are heaven. Seriously, heaven. And surprisingly easy to make. 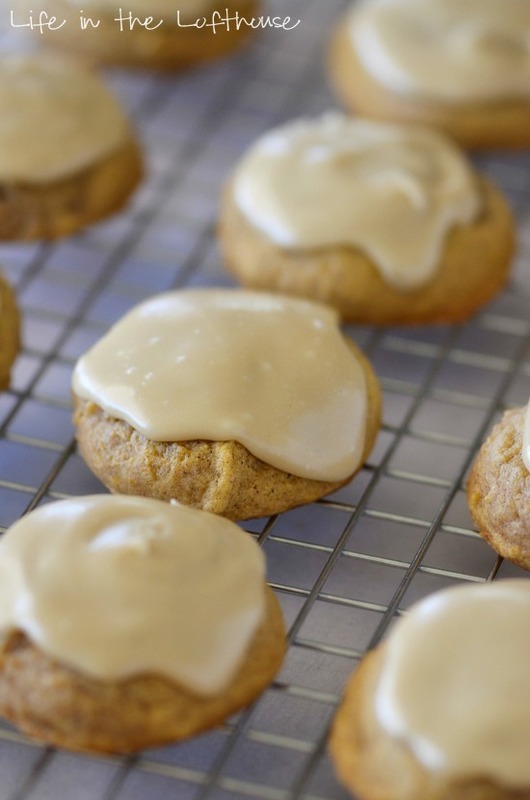 The cookies are packed with pumpkin spice flavor, and that caramel frosting just takes them to the next level! Click here to view the rest of the recipe. And be sure to thank Holly for being such a great hostess! Sharing links to South Your Mouth is welcomed and encouraged (please and thank you!). Please do not copy/paste full recipes to any social media (Facebook, etc. ), blogs or websites. Unauthorized use of content and photos from South Your Mouth © 2011 is a violation of both the federal Digital Millennium Copyright Act (DMCA) and copyright law. Oh, my goodness, these cookies look breathtaking!